Camping Municipal de Troyes es un camping con 150 parcelas de rotación. Durante la temporada baja, entre 01-04-2019 - 30-06-2019 y 25-08-2019 - 15-10-2019, la tarifa por noche es de €20 en una de las 150 parcelas de rotación en Camping Municipal de Troyes en Camping Municipal de Troyes (Aube). En este camping, no solo podrá utilizar su CampingCard ACSI para acampar de manera económica, sino que también podrá utilizar su ACSI Club ID (como un ID alternativo). Acogedor y con muchos árboles y ardillas. 2 km de la ciudad medieval o con autobús 1. Ideal como camping de paso o para estancias largas. Piscina climatizada a partir del 15/05. Rutas de bici llanas cerca. 1001 casas de revestimiento de madera, museos, etc. Salidas antes de las 15h. Very friendly informative reception. Information given on city and best areas to visit. Liked being able to chose own pitch. Varied sizes available. Troyes definitely a city to visit. Beautiful city with loads to see. Would definitely recommend. Intended stopping 2 nights, but stayed for 4. Very convenient for the lovely town of Troyes. Beware on arrival - do not put into your Sat Nav No 7 rue Roger Salengro, Troyes as you will end up in the centre of the old town near the cathedral - the address is the same road name but Pont Ste Marie!, and very easy to find if you come direct off the Autoroute. The site can get very busy and is a bit sordid when it is busy (many plots not delimited, so you don\'t know how much space you\'ve got - or how much you\'ll come back to!) but it\'s lovely when a bit quieter. We decided to go here because of direct access to the town centre. The welcome was very cheerful and informative. The pitch is an excellent size with shade and sunny pitches available. There is a decent bike route which is easy and level. The site was very busy over the weekend. There are decent restaurants in the area. The only downer on this site is the mossies, no matter what replant we used it was feast time, decided to move because of this issue. Difficult to find as the address given in the ACSI book does not seem correct. So after some driving around Troyes we eventually found it! Good campsite for a night halt or couple of days. pleasant and helpful staff. 20 minute walk into town, which is lovely with plenty of cafes and restaurants. Aldi supermarket next to site. Small, but clean swimming pool on site. The camp is in a lovely wooded setting with both sun and shade; and really well laid out in little \'cut de sacs\', so though it is a large site, it doesn\'t feel like it. The staff are welcoming and friendly. There are restaurants and shops in close walking distance, while Troyes is about a 20 - 30 minutes walk (walking slowly), or you can get the bus. Troyes centre is worth visiting, with great shops, restaurants and things to see/visit. The sanitary facilities are clean and accessible. There is a pool, but it is very small. The drawback is the cost, you are paying for the close proximity to Troyes. Close enough to city centre to walk or cycle. Toilet / shower facilities not good (worst we’ve been to on this trip). Take away chips on site plus other food and tv room. If wet many pitches difficult to get in or out as very muddy. Troyes a historic town with interesting buildings. The biggest mosquitos I have ever seen!! Site is a bit tired looking but Troyes was worth a visit. An over night stop only recommendation. Loved this site. How refresing it is to be able to camp anywhere in whatever position you choose. Free from that Car Park feel of all lined up in a row facing the same direction. Beautiful green country feel. Reminded me of camping in the 1960\'s nicely laid back but clean. Surprised how busy it was. Staff friendly and helpful. Troyes is a great place to visit, enjoy the camp site. Would love to stay again when the Pool and Bar are open. Most toilet/ showers closed as low-ish season, a bit basic and if you offer early season camping facilities should match. That said owner friendly and we liked the site. Mostly grass pitches which would have sunk our motorhome and indeed did for one German guy but a really pleasant feel, almost an arboretum surrounded by the city allotments. Very peaceful. Easy to find. Well kept site with plenty of shaded pitches. Excellent domestic facilities in a central block. 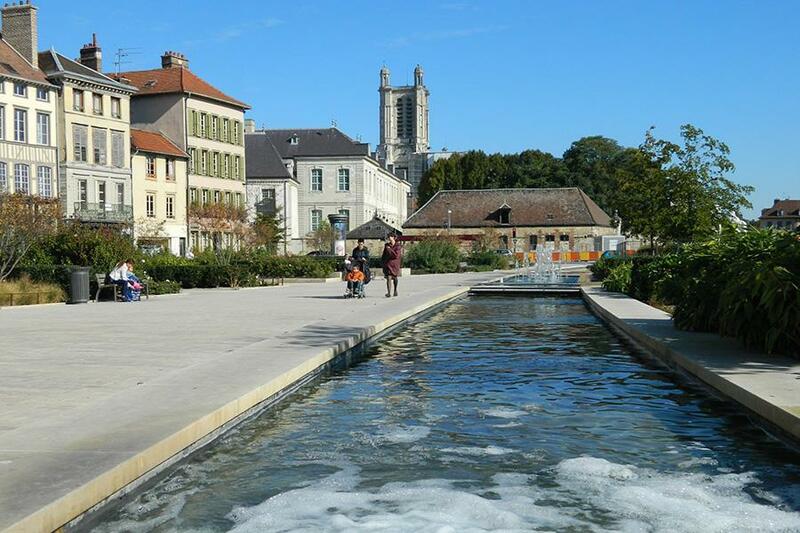 It's location just 2 or 3 kms from the ancient town of Troyes is a great bonus. There is a bus stop close to the gate for the no 1 bus which drives into the town centre. Lots of things to do and see in the town. There is a new Aldi supermarket 100 mts from the site gate. Would certainly use again. Only disappointment was the fact that ACSI rated ceased on 15 June. ¿Desea reservar u obtener más información sobre su Camping Municipal de Troyes? Puede hacerlo mediante los datos siguientes. A26, sal. Troyes/Pont-Ste-Marie. Después seguir señales del cp. municipal. Otras vías de acceso, dir. Pont-Ste-Marie. En la ciudad seguir señales. El camping está en Pont-Ste-Marie. CampingCard ACSI reenvía su solicitud de información al "Camping Municipal de Troyes".